Primarily driven by rising government support the renewable chemical industry has reached more than $50 billion. Renewable chemicals mostly constitute alcohols such as Methanol and Ethanol. Other renewable chemicals include Platform Chemicals and Bio Polymers. 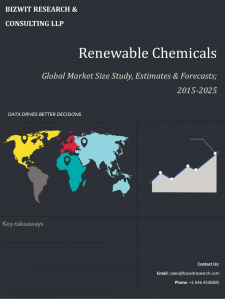 The Chemical industry has witnessed increased demand for renewable chemicals, thus, accumulating several growth opportunities in coming years. Some of our top selling renewable chemicals reports are Global Biodegradable Polymers Market, Global Bio Poly Ethylene (PET) Market, Global Bio Succinic Acid, Global BioFuels and Bio Diesel Market.